Chronic kidney disease (CKD) occurs from continued damage to your kidneys. Normal, healthy kidneys remove waste from the blood. Then, your body removes the waste in your urine. Kidneys help to control your blood pressure and make red blood cells. If you have CKD, your kidneys cannot remove waste from the blood as well as they should. Almost 20 million people in the United States have this disease. swelling of feet and ankles. The most common causes of CKD are high blood pressure, diabetes, and heart disease. Infections and urinary blockages can cause CKD as well. CKD may be genetic (run in families). You may be at risk of CKD if you have diabetes or high blood pressure. Talk to your doctor about your risk factors. It is important to diagnose CKD early. Your doctor can review your symptoms and do an exam. There are 3 tests they may do if they suspect CKD. Blood pressure test: Checks for high blood pressure. Urine albumin: Checks to see how much protein is in your urine. Serum creatinine: Checks to see how much waste is in your blood. The American Academy of Family Physicians (AAFP) does not currently recommend screening for CKD in adults who don’t have symptoms. However, if you are at high risk of CKD, talk to your doctor to see if you should be tested. Can CKD be prevented or avoided? People who are at risk of CKD can do things to help prevent it. Lower your blood pressure if it is too high. Medicines called ACE inhibitors and angiotensin-II receptor blockers can help. They also can keep kidney damage from getting worse. Exercise and a healthy diet can help to lower your blood pressure. Manage your blood sugar level if you have diabetes. This often includes taking medicine and making changes to diet and exercise. Quit smoking if you smoke. Smoking damages your kidneys and raises blood pressure. It can interfere with blood pressure medicines. High triglycerides and cholesterol. Triglycerides are a type of fat. These levels often are higher in people who have CKD. Anemia. Anemia occurs when your blood doesn’t have enough hemoglobin. This is a protein that carries oxygen from your lungs to the rest of your body. Symptoms of anemia include feeling tired and weak. Weak bones. CKD can change the way your body uses minerals, such as calcium and phosphorus. This can cause your bones to weaken. People who have CKD may lose their appetite. A nutritionist can help you plan a diet that will keep you strong. Talk to your doctor about CKD and nutrition. He or she may want you to eat less protein. Too much protein can make your kidneys work too hard. Even with the right treatments, CKD can get worse over time. You need to have regular checkups so your doctor can check your kidney function. If your kidneys stop working, you have kidney failure. This happens when waste builds up in your body and poisons your blood. It can cause vomiting, weakness, confusion, and coma. Kidney failure is treated with dialysis. A special machine filters your blood to remove the waste build-up. 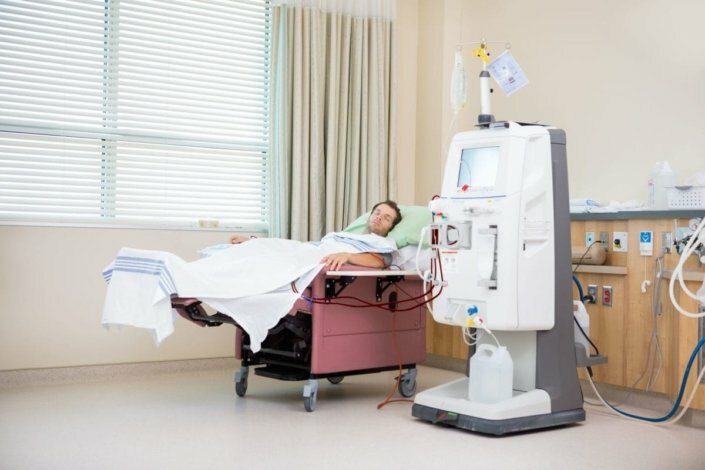 Dialysis may be done in a clinic or hospital setting. Some dialysis machines are small enough to strap to your body and use at home. What is the cause of my CKD? Is there a special diet I need to follow? Will I need to do dialysis?